My parents have lived in the same house for my entire life. Fifty years ago, my father bought the property in suburban Lancaster Pennsylvania for $3000.00 and built the house that same year (for an additional twenty five grand... ah, the fifties). When someone lives in a house for fifty years, they can accrue a lot of stuff. Perhaps that lack of moving is one of the major contributing factors to the pack rat tendencies of my entire family (although I’ve made great strides to get away from that). It’s also probably why my sense of nostalgia is stronger than most people’s. 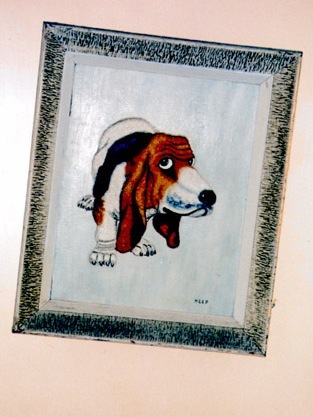 Sometime in the early Sixties, on a trip to New York City with his pal Ken (my brother’s namesake), my dad was walking past one of those sidewalk artist galleries, when something grabbed his eye: an oil painting of a basset hound, with the signature of the artist plainly written at the bottom right corner: “Heep.” He paid a couple of bucks for it and brought it back to Pennsylvania where it hung on the wall, sometimes in the living room, accentuating one of his “legendary parties” (according to a bronze badge that was bestowed upon him by one female guest). Only one photograph exists documenting one of these parties, and it’s so worn and faded that it’s hard to see. Click on the image below for a larger view, but you’ll have to strain to see the debaucherous details. What you will notice is Heep’s painting, hung over the fireplace, at a sharp angle. Heep never hung in the living room during my lifetime. Heep has, for the last forty years, hung in the stairway to the basement. It is the only thing adorning that area (unless you count the graffiti that covered those walls during my adolescence and the small marks measuring Kenny’s and my height as we grew). Both Kenny and I always took Heep for granted. We never really thought about it, never asked where it came from, never wondered who the artist was. Until one day, Heep wasn’t there. Long after my brother and I had moved out, my mother painted the hallway, covering up the punk rock / comic book scribblings that had been there for about a decade. But she neglected to rehang Heep when the job was finished. Until my brother and I were home one Sunday morning for brunch and noticed Heep’s absence. “Where the hell is Heep!?!?? !” we screamed. 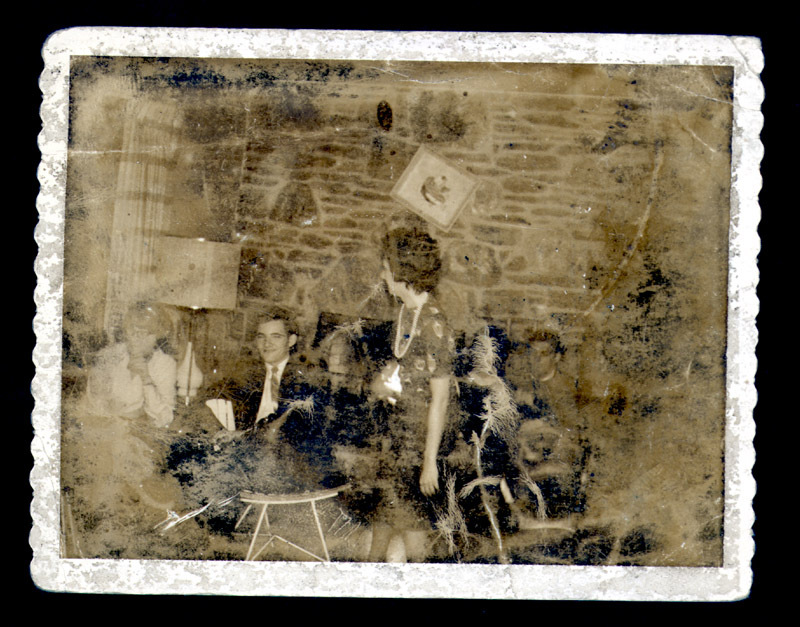 When our confused mother stated that she had just put it in the attic (since they don’t throw anything away), Ken and I threw a fit as if she’d tossed a bag of kittens in the Susquehanna River. Heep was quickly rescued from the silverfish-laden attic and returned to its place of honor. And, I must add, rehung at an angle. Heep must never be level, for it has never been level. Part of the glory of Heep is that it’s off-kilter. This bizarre little mediocre piece of art from four decades ago has attained an iconic status that few other things in our parents’ home have, at least to my brother and me (I have a small framed photo of Heep hanging over my bed). Our parents own a lot of antiques. There are tons of family heirlooms and photo albums and tools and books and things. But I’d wager that when that horrible day comes that Ken and I have to split up the detritus of our parents’ lives, the main thing we’ll fight over is Heep (the Volvo 1800 would take that spot if I hadn’t claimed it before my brother was even born). As we grow older, strange things become important. Heirlooms often have nothing to do with monetary value. Kenny and I don’t love Heep because of some great affinity for basset hounds or outsider art. We love Heep because it’s always been there. The thousands and thousands of times we walked up and down those steps, this weird painting looked down on us. And we’ve come to love Heep’s history... Heep was present before either or us, he even came before our Dad met our Mom. Ah, if only Heep could talk.... the tales Heep would tell.